There are various Test required on Transformer to conform performance of Transformer. Mainly two types of transformer are done by manufacturer before dispatching the transformer mainly (1) Type test of transformer and (2) Routine test. In addition some other tests are also carried out by the consumer at site before commissioning and also periodically in regular & emergency basis throughout its life. A Routine test of transformer is mainly for confirming operational performance of individual unit in a production lot. Routine tests are carried out on every unit manufactured. Polarity / Vector group Test. No-load losses and current Test. Short-circuit impedance and load loss Test. Test on On-load tap changers, where appropriate. Temperature rise test (IEC 60076-2). Dielectric type tests (IEC 60076-3). Special tests are tests, other than routine or type tests, agreed between manufacturer and purchaser. Zero-sequence impedance on three-phase transformers. Harmonics on the no-load current. Power taken by fan and oil-pump motors. Determination of capacitances between windings and earth, and between windings. 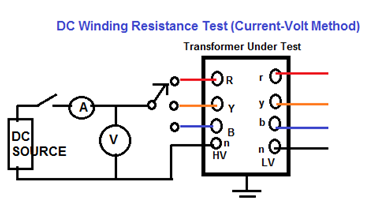 Determination of transient voltage transfer between windings. Tests intended to be repeated in the field to confirm no damage during shipment, for example frequency response analysis (FRA). The Test performed before commissioning the transformer at site is called pre commissioning test of transformer. These tests are done to assess the condition of transformer after installation and compare the test results of all the low voltage tests with the factory test reports. Insulation resistance test of transformer is essential to ensure the healthiness of overall insulation of an electrical power transformer. For LT System: Use 500V or 1000V Megger. For MV / HV System: Use 2500V or 5000V Megger. Megger leads to be connected to LV and HV bushing studs to measure Insulation Resistance (IR) value in between the LV and HV windings. NB: It is unnecessary to perform insulation resistance test of transformer per phase wise in three phase transformer. IR values are taken between the windings collectively as because all the windings on HV side are internally connected together to form either star or delta and also all the windings on LV side are internally connected together to form either star or delta. Oil temperature should be noted at the time of insulation resistance test of transformer. Since the IR value of transformer insulating oil may vary with temperature. Absorption Coefficient = 1 minute value/ 15 second value. To Calculation of the I2R losses in transformer. To Calculation of winding temperature at the end of temperature rise test of transformer. Wheatstone bridge or DC resistance meter. The main principle of bridge method is based on comparing an unknown resistance with a known resistance. When electric currents flowing through the arms of bridge circuit become balanced, the reading of galvanometer shows zero deflection that means at balanced condition no electric current will flow through the galvanometer. Very small value of resistance (in milliohms range) can be accurately measured by Kelvin Bridge method whereas for higher value Wheatstone bridge method of resistance measurement is applied. In bridge method of measurement of winding resistance, the error is minimized. The resistance of each transformer winding is measured using DC current and recorded at a ambient temp. Before measurement the transformer should be kept in OFF condition at least for 3 to 4 hours so in this time the winding temperature will become equal to its oil temperature. Voltmeter leads shall be independent of the current leads to protect it from high voltages which may occur during switching on and off the current circuit. The readings shall be taken after the electric current and voltage have reached steady state values. In some cases this may take several minutes depending upon the winding impedance. For Calculating resistance, the corresponding temperature of the winding at the time of measurement must be taken along with resistance value. According to IEC 60076-1, in order to reduce measurement errors due to changes in temperature, some precautions should be taken before the measurement is made. For Delta connected Winding: for delta-connected transformer, the resistance should be measured for each phase (i.e. R-Y , Y-B & B-R) .Delta is composed of parallel combination of the winding under test and the series combination of the remaining winding .It is therefore recommended to make three measurements for each phase to-phase winding in order obtain the most accurate results. For Star connected winding: the neutral brought out, the resistance shall be measured between the line and neutral terminal (i.e. R-N , Y-N,B-N) and average of three sets of reading shall be the tested value. For Star connected auto transformers the resistance of the HV side is measured between HV terminal and IV terminal, then between IV terminal and the neutral. For Dry type transformers: the transformer shall be at rest in a constant ambient temperature for at least three hours. For Oil immersed transformers: the transformers should be under oil and without excitation for at least three hours. In case of tapped windings, above readings are recorded at each tap. In addition, it is important to ensure that the average oil temperature (average of the top and bottom oil temperatures) is approximately the same as the winding temperature. Average oil temperature is to be recorded. Measured values are to be corrected to required temperatures. The values shall be compared with original test an result which varies with the transformer ratings. DC Resistance Should be<=2% Factory Test. Loose Connection or High Contact Resistance on Tap Changer. Low Pressure Sodium (LPS) lamp is by far the most efficient light source used in street lighting. LOW Pressure Sodium is not an HID source. IT is a gaseous discharge type lamp, similar in operations to fluorescent lamps. While very efficient (160 lumens/watt), LPS lamps are monochromatic light source. They produce only one light color, a dirty yellow color. That is CRI for LPS is negative. When this type of lamp is first switched on, a small current passes through the gas giving off a faint red discharge. After several minutes the sodium inside evaporates. This makes colour perception very difficult which means that it is almost solely used for street lighting. Lamps require special ballasts and increase material size as the wattage increases. Large size makes it difficult to obtain good light control in a reasonably sized fixture. For a long time the poor color rendition, when the lamp is on, everything around it looks either orange-yellow, black or shades in between them so LPS lamp made it unpopular for use in other than industrial or security applications. The wattage (energy used) increases as time passes(Age of Lamp increased). These are the latest and most energy efficient options for street lighting. Their brightness is much more uniform and can give up to 50% savings over Sodium Vapour lamps. Produce less glare and can reduce visual fatigue for drivers and pedestrians. Very expensive to buy with longer paybacks. They also LEDs offer the following advantages when used as light sources in street lighting applications. Adequate heat-sinking is required to ensure • long life with high-powered LED. Light Color: LED Produce more natural white / yellow light. High Pressure Metal Halide Lamp (HPMH) Moderately long lamp life. High light output.Makes colors look close to natural. High initial cost. High Pressure Mercury Vapor Lamp (HPMV) Long lamp life, High light output. High initial cost. The amount of light emitted upward or lower side of laminar and at high or low angle is called shielding of Lights (“Cut off”). It is classified on how much of light is dispersed above the horizontal line of luminaries. There are Four Type of arrangement of Luminaries (1) non cutoff, (2) semi cutoff,(3)cutoff, (4)full cutoff. The non-cutoff fixtures usually include the globe-shaped lamps that are mounted on top of lampposts. These lamps distribute their light in all directions. A major problem is created by the light pollution and glare, as they shoot their light upwards into trees and towards the sky rather than down towards the ground. Non-cutoff fixtures are rarely found on roadways because they tend to blind the driver. These fixtures do a very good job of spreading the light towards the ground but some up light is possible, though not as serious as non-cutoff fixtures. Semi cutoff fixtures are often mounted on tall poles. This is the most popular street lighting, lighting distribution arrangement. The semi cutoff fixtures usually refer to the cobra heads, but they can also apply to some lamppost-mounted fixtures that do not emit their light upwards. Little control of light at property line. Potential for increased glare when using high wattage luminaries. Typically directs more light into the sky than cut-off. This type light gives more light control than semi cutoffs. Cutoff fixtures have gained popularity in recent years. Small increase in high angle light allows increased pole spacing. Allows some up light from luminaries. Small overall impact on sky glow. These lights do not allow any of the light to escape the fixture above 90 degrees (90 degrees above nadir). 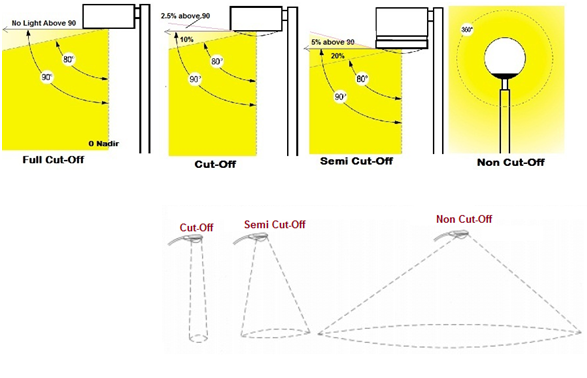 Full-cut offs distribute light in a defined pattern, potentially providing more light on the ground at lower power consumption. Full cutoff luminaries are totally environmentally friendly (causing no light pollution). Limits spill light onto adjacent property, reduces glare.